Zurich, Switzerland: New7Wonders has just launched the Wall of Wonders, a web-based platform designed to bring together the people of the world. Today, 07.07.2014, this interactive wall launches on what is the 7th anniversary of the historic first-ever global vote and election of the New7Wonders of the World in 2007. The Wall of Wonders enables people to become the Wonder. 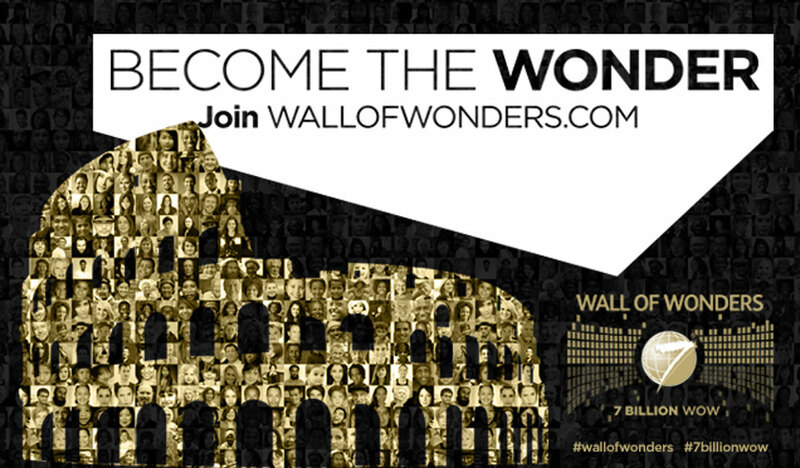 To join the movement, users just register on the the Wall of Wonders website and upload their own photo. The more photos the Wall of Wonders has, the clearer the picture of the chosen New 7 Wonders becomes. Photo coordinate positions can be shared with friends, and over time positions change and are updated as the overall picture detail improves. All the images, comprising millions and millions of pixels made of photos of people from all over the world, of all races, religions and cultures, create the full wall image of the voted New7Wonders of the World and the New7Wonders of Nature. The man-made New7Wonders of the World, chosen by over 100 million votes, are, in alphabetical order: Chichén Itzá; China Great Wall, Christ the Redeemer; the Colosseum; Machu Picchu; Petra, and the Taj Mahal. The New7Wonders of Nature, chosen by over 500 million votes, are, in alphabetical order: Amazon, Ha Long Bay, Iguazu Falls, Jeju Island, Komodo, Puerto Princesa Underground River, Table Mountain.